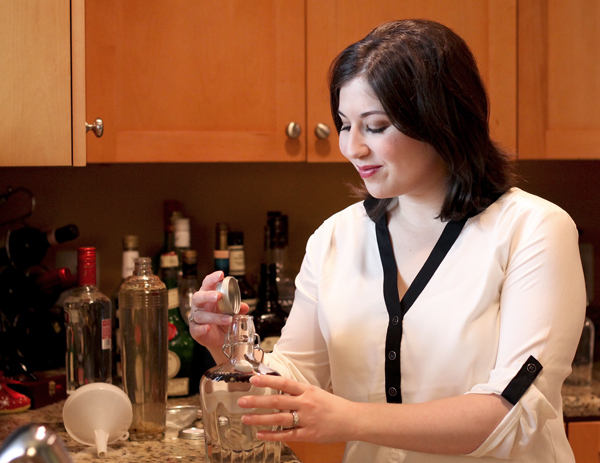 Alumna Sarah Maiellano pours juniper berries into a bottle of vodka, one of the first steps in creating gin with the homemade gin kit she created. Sales of the HomeMade Gin Kit created by 2007 alumna Sarah Maiellano and her husband Joe Maiellano have soared in the last seven months – an unlikely success story that started taking shape because of their passion for spirits and penchant for experimentation. The kit allows consumers to create a small batch of gin at home in 36 hours, and 5,000 units have been sold online through websites like RedEnvelope, Fab and UncommonGoods. They are expected to hit brick-and-mortar stores within a few months. The pursuit is a natural fit for the husband-and-wife business partners. They share a passion for fine beverages, taking their engagement photos at a craft cocktail bar in Old Town Alexandria, getting married in a Virginia winery and spending their Colorado honeymoon touring breweries. Inspiration struck Joe Maiellano when he came across small batch tonic water and imagined it would pair nicely with the right gin. When he could not find a blend of gin with the properties he wanted, he decided to develop his own. “I tinkered with the recipe and process for a long time before deciding on the perfect blend. I’m a huge gin fan, so I knew what I was looking for,” Joe Maiellano said. After experimenting with more than 12 formulas, the Maiellanos were so pleased with the results that they explored expanding the product with friend Jack Hubbard, who proposed the cost-effective alternative of an at-home kit. The trio chose not to pay for advertising and anticipated modest sales during the first few months as they juggled other full-time jobs. But they vastly underestimated consumer interest, selling over 2,000 kits between Christmas and Father’s Day – 10 times their projected sales. Sarah Maiellano noted her degree in political communication from GW serves her well as the communications coordinator for the company. Through marketing by word of mouth, the kit has been reviewed by The New York Times and the Los Angeles Times. Craft distilling has expanded nationally, with the emergence of organizations like The American Distilling Institute and publications like American Spirit Magazine. New Columbia Distillers opened in D.C. last August, the first distillery in town since the Prohibition era. As the industry continues to grow, Sarah Maiellano sees promise in her company.